I found this recipe in the new 21 Day Sugar Detox book. I finally broke down and bought the actual book instead of googling recipes or looking for them on Instagram. Great book too! There are two books I guess, one that has all the info about the sugar detox, what food is okay- what food isn’t- and how you will be feeling each day, what sugar is in, what it does to you, etc.. Then a ton of recipes. There is another one that is coming out this month that is JUST recipes. I will probably break down and buy that one too. So I have to say, if you haven’t tried doing a sugar detox its a great way to jump start your tastebuds. All of a sudden foods that don’t normally taste sweet start tasting really sweet and you begin to wonder if they are allowed! Like avocado’s. Or butternut squash, now that just tastes like candy after a few days on this! Anyhow, this recipe is really yummy and has some of my favorite items- artichokes and olives! Easy prep, easy bake, and just make sure you don’t spill the turmeric or sauce on the counter or you will be scrubbing bright yellow stains away for days. 1. Grease a casserole dish with 2 tbls of ghee or butter. Then place the artichoke hearts, olives, and olive juice inside the dish. Place the chicken thighs on top. I cleaned them and sliced off any fat there was on them. You can also use chicken breasts too if you like. 2. In a small mixing bowl, combine all the spices together. Sprinkle the mixture over your chicken. I sprinkled on one side and then turned it over and sprinkled the other side so it was completely coated. If there is any left, distribute the rest over the artichokes. 3. 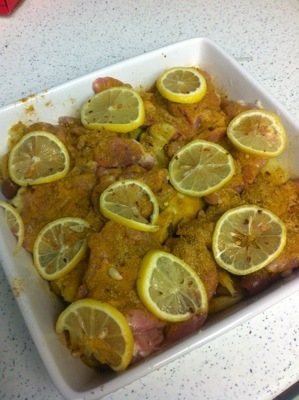 Cut the lemon in half and then into small slices and place a slice on top of each chicken. Squeeze the other half of the lemon into the dish. Sprinkle with chili flakes if you add those. 4. Cover the dish with tin foil and bake for about 20 minutes. Remove the foil and bake for an additional 20 minutes to make sure the chicken is cooked throughout. 5. Serve with some steamed asparagus or any other green veggie! 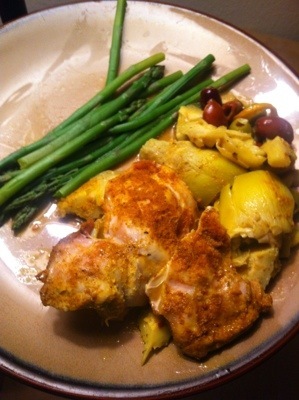 Posted by paleoyummers on December 4, 2013 in Chicken, Dinner, Sugar Detox approved!